The induction ceremony will take place on Friday, September 18, 2015, at 10 a.m. at the Beckman Institute for Advanced Science and Technology (405 N Mathews Ave., Urbana). It is for the first time this year part of a wider celebration: Impact Day will celebrate University of Illinois engineering students, faculty, and staff whose accomplishments drive the economy, reimagine engineering education, and bring revolutionary ideas to the world. The ceremony is open to friends, family, and supporters, and Physics students and faculty are encouraged to attend. Leggett is a member of the National Academy of Sciences, the American Philosophical Society, the American Academy of Arts and Sciences, the Russian Academy of Sciences (foreign member), and is a Fellow of the Royal Society (U.K.), the American Physical Society, and the American Institute of Physics. He is an Honorary Fellow of the Institute of Physics (U.K.). 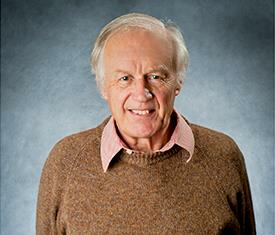 He was knighted (KBE) by Queen Elizabeth II in 2004 "for services to physics." Leggett has a long history of service to the global scientific community and is currently the director of the Shanghai Center for Complex Physics, Shanghai Jiaotong University, and a distinguished visiting professor at the National University of Singapore. He is also the Mike and Ophelia Lazaridis Distinguished Research Chair at the Institute of Quantum Computing and Department of Physics and Astronomy, at the University of Waterloo, Ontario, Canada. Leggett is the recipient of numerous academic honors, including the Distinguished Service Medallion of the University of Illinois (2009), the Wolf Foundation Prize for research on condensed forms of matter (with B. I. Halperin, 2002/03), and the Eugene Feenberg Memorial Medal (1999). He is also noted for his dedication to and excellence in training the next generation of scientists. Leggett received his bachelor’s degree in physics from Merton College, Oxford University, in 1961, graduating with first class honors. He received his doctoral degree in physics from Magdalen College, Oxford University, in 1964. He holds honorary degrees from universities of Sussex, Oxford, British Columbia, St.Andrews, Tokyo, and Universidad Complutense (Madrid,Spain). He joined the physics faculty at Illinois in 1983.